Nearly a year, Madrid May 2009, has elapsed since Roger Federer and Rafael Nadal butted heads in an ATP final. Fans were hopeful that Federer and Nadal would rekindle their rivalry at the Sony Ericsson Open. That possibility was dashed in the fourth round as Tomas Berdych beat Federer 6-4,6-7,7-6. 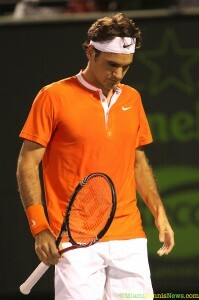 Federer had been fumbling his way through the tournament. Still, the wish was that the world number one’s luck would not run out. Subsequent to Berdych and Federer’s first meeting at the 2004 Athens Olympics where the former prevailed, the latter has claimed their next eight bouts. At the 2009 Australian Open, Berdych carried the first two sets, but still went down in flames. Perhaps that performance bolstered Berdych’s morale leading him to believe that his fortune could be better in a best of three sets contest. After a double fault gave Federer a break point, the world number one broke to open the match, then consolidated for 2-1. In a game where Federer donated a double fault, Berdych got two chances to break. On his second opportunity, Berdych knotted the set at 3 all. Down the road as Federer served to push the set to a tiebreaker, at love-40, he double faulted to gift Berdych the set. From the opening game of the second set, Federer applied pressure, but failed to convert on four break point opportunities. The same story was repeated in the 7th and 9th games. Finally in a tiebreaker, Federer captured the second set. In the third set, after breaking, Berdych stretched his advantage to 3-1. However, serving at 4-3, Berdych double faulted on double break point to equalize things at 4 all. With no break point the rest of the way, a tiebreaker settled the set. Post saving match point at 6-7, Berdych won the next three points to seal the victory and quarterfinal spot. Fernando Verdasco, Berdych’s quarterfinal opponent, is probably relieved not to see Federer against whom he has a 4-0 lifetime mark. Verdasco triumphed over the 7th seed, Marin Cilic, 6-4,7-6. In the round of 16, Nadal clashed with countryman David Ferrer. After the two exchanged early service breaks and neither manufactured another break point, the set went to a tiebreaker. In the latter stages, Nadal finally strung together two consecutive points to claim it. In the second set, Nadal went up by a break. However, again, Ferrer crawled back to 4 all. With Ferrer serving to tie the set at 5 all, Nadal gained the upper hand and penned his name into the quarterfinals . Nadal takes on Jo-Wilfried Tsonga. Earlier in the day, Tsonga sent Juan Carlos Ferrero home in straight sets 6-2,6-2. Also into the quarterfinals are Andy Roddick and Nicolas Almagro. Roddick defeated Benjamin Becker 7-6,6-3. Almagro prevailed over Thomaz Bellucci in three sets. These two will do battle in the next round. Unfortunately for Mardy Fish, a sciatic nerve injury caused him to pull out of his match against Mikhail Youzhny. Fish was on the losing end 1-6,0-1 when he retired. Youzhny has Robin Soderling as his quarterfinal adversary. Soderling dismissed Fernando Gonzalez in three sets 6-0,6-7,6-2. After fighting off Daniela Hantuchova tooth and nail to advance to the quarterfinals, Williams eased her way to the semifinals with a 6-3,6-1 win over Agnieszka Radwanska. Williams secured a break for 2-1 on Radwanska’s opening game. Promptly though, Radwanska squared the set at 2 a piece. Then, with back to back double faults, Radwanska went down 15-30, Williams won the next two points for a 5-4 lead. With an easy game, Williams closed out the first set. The second set, Williams once more took Radwanska’s first service game. By allowing Radwanska only one game the entire set, Williams walked into the semis. Venus meets Marion Bartoli. Bartoli defeated Yanina Wickmayer 6-4,7-5 to advance to her first semifinal in Miami. For the second straight day at the Sony Ericsson Open, a highly ranked male seed went out in the second round. World number three and defending champion, Andy Murray, was beaten by Mardy Fish 6-3,6-4 . Although Roger Federer, the number one seed, was pushed by Nicolas Lapentti. Federer still won comfortably 6-3, 6-3. In the opening set, in a game in which Fish double faulted, Murray captured the break for 3-1. However, the next game, Murray threw in a double fault on break point permitting Fish to get back on serve. With Murray serving in the ninth game, Fish attained triple break point. Despite Murray reaching deuce and game point, Fish would not be denied. Mardy manufactured two more break point chances and converted. Then, on the third asking, Fish closed out the first set. Poor serving and a tentative return game were what Murray brought to the table; thus, Fish took full advantage. The initial game of the second set, Murray double faulted handing Fish his second break point opportunity, the American converted. After consolidating and widening his lead to 3-1, Fish cruised on serve. However, in the eighth game, Fish faced a 15-40 deficit. Once again, the serve was his ally. By raining a few bombs, Fish extricated himself out of this jam and maintained a 5-3 lead. After Murray held, serving out the match, Fish once more was down break point. Still, Fish snuffed Murray’s advantage with his serve. Subsequently, with a couple of aces and unreturnables, Fish sealed the win. Q. You know this court almost more than anyone else. You practice here all the time. What made the difference in today’s match? MURRAY: Well, Mardy served well when he needed to. You know, especially the second set when he was down break points he served well. But I just wasn’t very good today, and I’m going to need to get a lot better. After Murray’s debacle, a love-30 start to Federer’s opening game and a break point the subsequent one by Lapentti were preoccupying. Still, with a few good serves, Federer held to stay on serve. For his part, Lapentti had no difficulty holding with back to back love games for 2 all. After multiple errant forehands, with Lapentti serving at 4-5, Federer connected on a forehand up the winner for deuce. Later, Federer provoked a backhand error by Lapentti resulting in break point. Then, the world number one produced a stellar backhand down the line pass to go ahead 5-3. Following, with an easy game, Federer slammed the door on the first set. Lapentti revealed no signs of disappointment, starting the second set strongly in part aided by Federer having trouble finding his mark with the forehand. Similarly, Federer continued to have routine service games. The good thing for Federer was that when it mattered, his forehand showed up. With Lapentti serving at 3 all, Federer obtained break point with a forehand up the line winner. When Lapentti’s forehand sailed long, Federer had the crucial break. After getting out of love-30 mess to consolidate, with a backhand crosscourt winner, Federer broke Lapentti to finish the match. As anticipated, Robin Soderling, Marin Cilic, Fernando Gonzalez and Fernando Verdasco advanced, all in straight sets. Seeds Mikhail Youzhny, Tomas Berdych, Stanislas Wawrinka, Juan Monaco, Jurgen Melzer, Marcos Baghdatis and Feliciano Lopez also moved on without difficulty. On the other hand, Alberto Montanes, the 26th seed, Gilles Simon, seeded 20th, and Janko Tipsarevic, the 31st seed, were ousted. For the women, it was business as usual. Svetlana Kuznetsova, the top seed, with a 6-2,6-3 win, sent Agnes Szavay home . Venus Williams said arrivederci to Roberta Vinci with a 6-1,6-4 victory. Agnieszka Radwanska took care of Ana Ivanovic 7-5,7-5. Both Yanina Wickmayer and Marion Bartoli only needed two sets to pass to the round of 16. The night match between Daniela Hantuchova and Nadia Petrova was less stimulating than expected. Hantuchova prevailed over Petrova 6-2,6-4. Timea Bacsinszky had an easy time with Polona Hercog 6-2,6-2. Her next round will be more challenging as she faces Wickmayer. The shocker for the women came from the doubles field as the top seed Cara Black and Liezel Huber were defeated in the first round by Natalie Grandin and Abigail Spears. 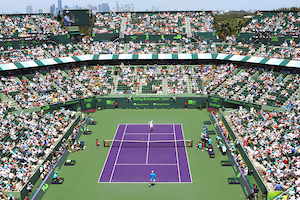 Second round play for the ATP concludes today at the Sony Ericsson Open with Roger Federer and Andy Murray from the top half of the draw the feature attraction. On the women’s side, Svetlana Kuznetsova and Venus Williams play for a spot in the round of 16. Fernando Verdasco, the 10th seed, begins the proceedings on stadium court by taking on Dudi Sela. That’s followed by Williams and Roberta Vinci, their first tour meeting. Then, Murray, the 3rd seed and defending champion, starts his title defense by facing American Mardy Fish. Murray holds a 3-1 record versus Fish and has prevailed in their last three meetings. The afternoon session finishes with Kuznetsova battling Agnes Szavay. In 2007, Szavay reached her first WTA final in New Haven and the quarterfinals at the U.S. Open. Both times, then 18 years old, Szavay’s dream run came to an end at the hands of Kuznetsova. These two have not played since. Therefore, this should be an intriguing battle. On the outside courts, Ana Ivanovic attempts to knock out 6th seed Agnieszka Radwanska. The latter defeated the former for the first time in Rome on clay last year. With Ivanovic struggling with her game, Radwanska may run away with this one. 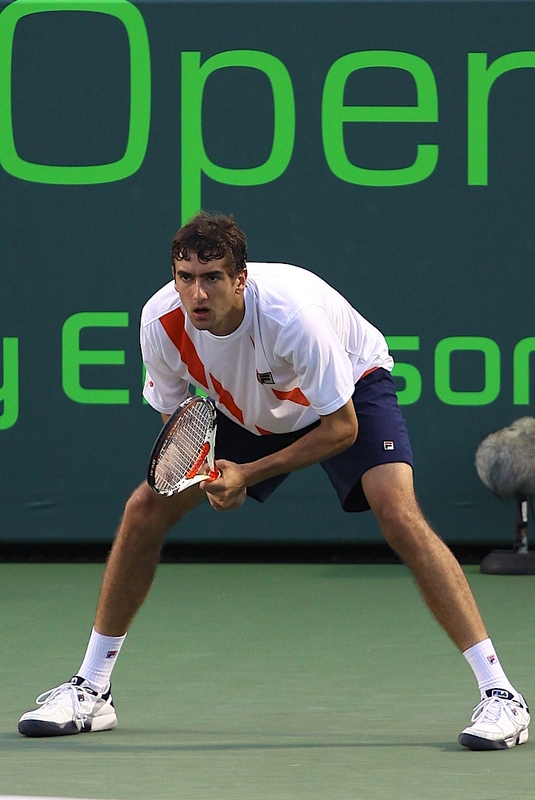 Marin Cilic, the male 7th seed, faces Stephane Robert. This is the initial encounter for these two. With Cilic at the highest ranking of his career, it should be an uncomplicated match. Also, Robin Soderling, seeded 5th, squares off against Peter Luczak. Soderling won their only previous skirmish in 2005 in straight sets. In the evening, Federer takes on Nicolas Lapentti. With a 3-0 record against Lapentti, this should be no head-scratcher for the world number one. The ladies’ night match-up is Nadia Petrova and Daniela Hantuchova. Petrova leads their head to head 4-1. It’s men’s day at the grandstand where the must see players include Mikhail Youzhny, Fernando Gonzalez, Marcos Baghdatis and Gilles Simon. In addition, Rafael Nadal and fellow Majorcan Bartolome Salva-Vidal clash with doubles second seed Mike and Bob Bryan.